I'm unable to find the model number. Where can I find it? I need to find a part for my saw. This saw belonged to my great uncle, Lars Boyd, a building contractor in the 1940's and 1950's in Seattle, Washington. Here are the numbers I have: Serial Number: CC 3539; I find the number TAB 140 on the underside of the table part of the saw. This saw has been stored in several places and had become very rusty. It is now cleaned up and working. It has a Craftsman motor which is working. The name Delta Rockwell is written on the base of the saw. The missing piece is the insert from which the blade protrudes. The piece is an oval measuring 10 1/4 inches by 3 1/2 inches with a depth of 3/8 inch. Any help you can give me to find either the model number or the part would be appreciated. Thanks for the suggestion to look at Grizzly. I did make a plywood insert and it is working just fine but would love to find an original. The blade on the saw is 8 1/4 inches. Does that mean it is an 8 inch saw? Where does one measure to determine the size of the saw? Are you sure it's not an 8"? Go to grizzly, they have some inserts. All mine are plywood now, getting an original is difficult at best. You can adjust the height by sanding. Join in and write your own page! It's easy to do. How? 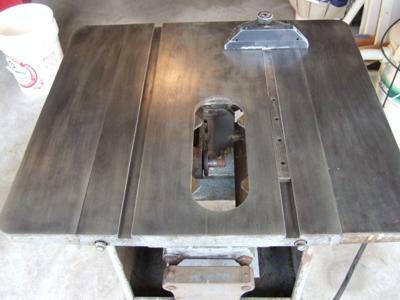 Simply click here to return to Vintage Delta Table Saws.